I live in a small isolated town in northern Nevada. So those fancy bakeries where you can get the super charming cakes like you see on the Food Network are sparse if they exist here at all. In my personal opinion though homemade cakes are always better. So that lead me to Pinterest. The cyber land of DIY anything and everything. You can find anything on Pinterest even how to make cute little easy birthday cakes. 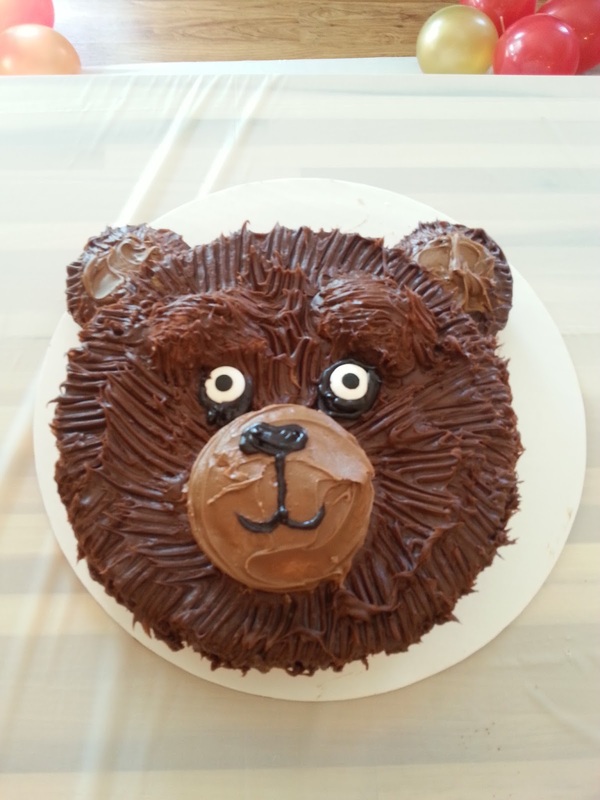 This is where I found the inspiration for Milo's Grizzly Bear Smash Cake. I'm sure someone more talented could have made this cake spectacular. Don't judge though it was made with love and without practice. I am certain that as Milo gets older and I have more experience his cakes will get better looking. Follow directions on cake mix and bake as follows. Lining pans with wax paper. (this aids in cake removal) Separate cake mixes into round cake pans and use extra as cupcakes for guests. Leave three of the cupcake molds unlined. Cover in entire cake, ears included, with chocolate icing. When you have the entire cake covered in chocolate icing rake over with a fork in short sweeping motions. This adds the "fur" effect. Place the third unlined cup cake in lower center for the snout. Using the remaining salted caramel icing place in a ziploc bag and snip one of the corners. Pipe salted caramel icing into the center of the ears and onto the snout. Smooth the icing over the snout with a knife. Use the black icing tube to detail the eyes and mouth. Now it's time for the finishing touch! Place the jumbo candy eyes and there you have it! 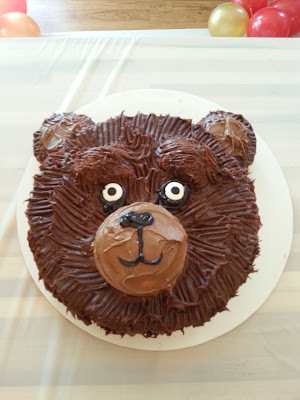 A Teddy Bear / Grizzly Bear smash cake! I absolutely love this! I'm seriously impressed. For my daughter's first birthday photo shoot, I bought a big cupcake from our local bakery for a buck or two. Wish I would have made something myself! Awesome job, mama. Thanks, I loved making his cake. Even though he was terrified of it lol. I actually took this inspiration from a polar bear cake. How cute would that be ! ?